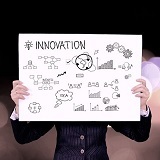 One of the best ways to find an idea for your new venture is to look at the technologies that are currently available to you and create something new by combining them. List the technologies that you know about. Add the technologies that your cofounder knows. List the combinations of those technologies. You can combine two or more technologies together. Think of needs that those combinations could satisfy. For example, a solar + webcam can produce solar powered webcams. Confirm that the needs are real and not already being satisfied. Research and discuss them with prospective customers. Each time you become aware of a new technology, brainstorm what new customer need it might be used to satisfy in combination with one or more of the other technologies.